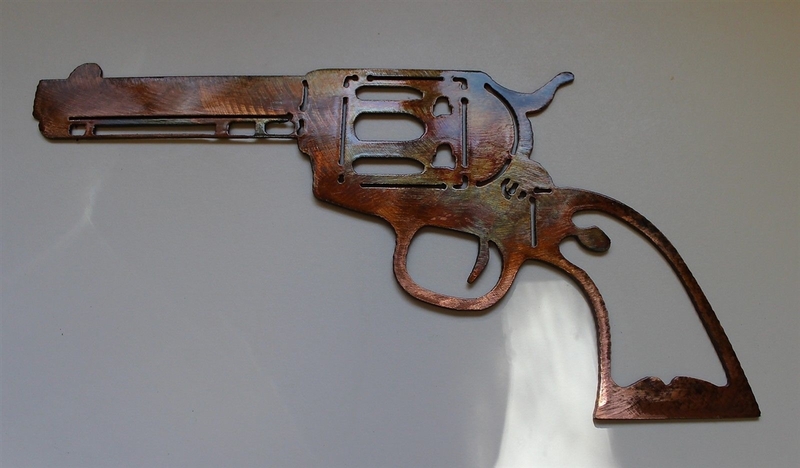 "1873 Colt Peacemaker Metal Wall Art"
Copper/Bronze plated , heat treated then clear coated. No piece is ever the same! Patriotic Tattered & Torn & Distressed American Flag Wall Art 31" x 17 1/2" Arizona Sun Metal Wall Art Decor 30" Kicking Back Cowboys on the Fence...by HGMW Southwestern Zia with Kokopelli Metal Wall Art Decor 14 "